You have probably seen planes; all with flat wings. But, have you seen anything flying with curly or round wings. Can a curled wing plane fly in the air? 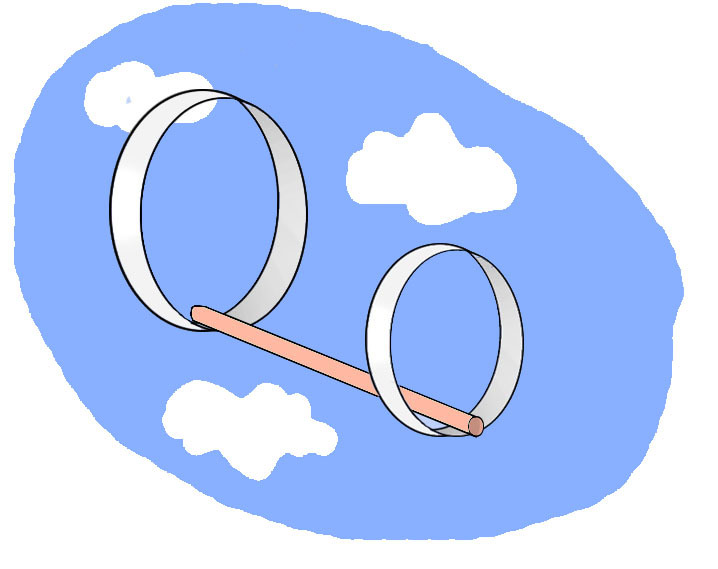 Let’s do an experiment to find out what will happen if we replace the flat wings of a plane with hoops. Let’s see how a plane with hoops can fly in the air? 1 Drinking Straw – 6 to 10 inch long is recommended. Take a sheet of stiff paper and cut it into 3 pieces. Each piece measuring 5 inches long and 1 inch wide. Take one piece of stiff paper and curl it to overlap its end edges, then tape them together to form a small hoop required for a glider. Take two other pieces of stiff paper and tape their end-edges together to make a long strip. Curl this long strip to overlap its two end-edges, then tape them together to form the second hoop of larger size. Tape the two hoops that you made in previous steps with straw. One hoop at one end of the straw, and another hoop at its second end. Straw should be kept inside of the hoops at the time of taping, and make sure that both hoops are aligned. That’s it! Your glider is ready. When you want to launch your hoop glider, just hold it in the middle of straw and throw it in the air like you do with a paper plane. NOTE: Both hoops should be on the top when you hold the straw, and smaller hoop should be facing in the direction of your throw at the time of launch. Two hoops in this glider are used to keep the straw balanced in the air while flying. Small size hoop keeps the glider from turning, and big hoop creates air resistance which keeps the straw leveled. Since both hoops have different weight so you may be thinking why the glider does not turn over? Actually, due to gravity lighter and heavier objects fall at same speed. That’s why the glider maintains its upright position. Try to change the length of the straw and see what happens. Find out! What happens, when the number of hoops is increased? First, try using 3 hoops, then 4. Abdul Wahab, "How to Make Hoop Glider," in Science4Fun, April 13, 2019, http://science4fun.info/how-to-make-hoop-glider/.